Frank Schwartz passed away on April 14, 2019 after a courageous battle with cancer. Frank was born in Tacoma, Washington on February 9, 1934. His parents, Marion Maycumber and Leonard Kelsey Schwartz, then moved the family to San Marino, California where Frank went on to graduate from South Pasadena High School in 1951. Like his father and sister before him, Frank attended Stanford University, where he graduated in 1955 with a Bachelor of Science in Industrial Engineering. While at Stanford, he was active in the Reserve Officer Training Corp (ROTC), and was a member of the Beta Theta Pi fraternity. His fraternity brothers gave him the nickname of “The Reverend.” He also played rugby and football for Stanford during the famed Chuck Taylor years. Frank served as a Lieutenant J.G. in the Navy from 1956 to 1958. He was a navigator aboard the USS Orleck and relished his time in the Navy Reserves traveling throughout the Pacific and the Far East. Frank then went on to Harvard Business School where he graduated with an MBA in 1960. It was during his time on the east coast where he met a young Wellesley woman named Carolyn who would become his wife in 1961. Frank’s first job was with Food Machinery and Chemical Corporation (FMC) in San Jose, California in the international division, which included conducting business in Japan. He was then offered a position as plant manager in Sacramento. In 1966, Frank returned to San Jose and entered what would become his lifelong career as a financial planner. After settling in Palo Alto in 1970, Frank enjoyed gardening (roses and artichokes were favorites) and volunteering for his son’s Y-Indian Guides. Every summer meant family trips to Lake Tahoe where he carried on his father and grandfather’s love of fishing – often taking his relatives and friends out to fish for mackinaw trout. His respect for family traditions also meant perfecting his grandmother Emmy’s fudge recipe that became a cherished holiday treat. 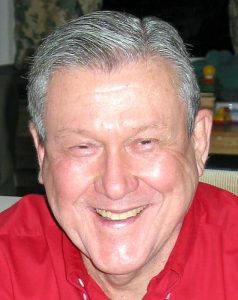 He was devoted to community engagement and service as a longtime member of the Kiwanis Club and Menlo Church. Frank particularly enjoyed leading group hikes to view wildflowers, cheering for Stanford football and joining his friends in bible study and fellowship. He is fondly remembered for his warm smile and his dedication to family, his church and his client work – including working right up until the end of 2018. Frank is survived by his beloved sister, Marilyn Brown of Portola Valley, his two children: Greg Schwartz of Brisbane and Linda Reed of Menlo Park, and his four grandchildren: Hana Schwartz, Kelsey Reed, Aryeh Schwartz and Jenna Reed, all of whom he loved dearly. Family and friends are invited to attend a Memorial Service on Monday, April 22 at 2:00 p.m. at Menlo Church in Menlo Park, California. In lieu of flowers, the family suggests donating on Frank’s behalf to the American Cancer Society or to Menlo Church in Menlo Park.